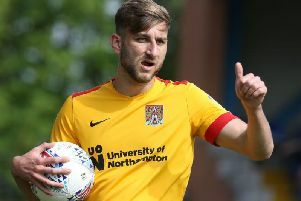 Cobblers defender Aaron Pierre admits his side must cut out the ‘silly errors’ which continue to plague them following Saturday’s last-gasp defeat at Cambridge United. Pierre, again captain for the day in the absence of Ash Taylor and David Buchanan, was on target in the 27th minute at the Abbey Stadium when he rifled home his fifth goal of the season to break the deadlock. But Jevani Brown’s sublime finish in first-half injury-time brought United level and despite Junior Morias restoring the visitors’ advantage shortly after half-time, George Taft and then David Amoo completed the turnaround. The Cobblers are 16th in League Two, only six points above the drop zone having won just two of their past 10 league fixtures. “It’s a very disappointing result in the end,” said Pierre. “I thought we were doing well for most of the game but we had a few injuries and they took over and dominated us in the midfield. “We started the game well and put them on the back foot quite a bit but we made some silly errors and allowed them to get back into it. Pierre was handed the armband for the first time last weekend when he captained the side against Carlisle United, and he admits the role brings extra responsibility. He added: “I think sometimes we switched off and that’s something we have to make sure we don’t do. As captain it’s up to me to make sure everyone around me is switched.